As a mixed media artist, I spend a lot of money on supplies. Seems every time I turn around there's a new "must have" product introduced. Do I want it? Do I need it? Should I buy it? Generally, the little kid inside me says "Yes, please!" But sometimes we purchase something with our hard-earned money only to find the item isn't all what it's cracked up to be. That's disappointing. And here's where reviews come into play. When you read or watch a review on a product you're interested in, you're better able to make an informed decision when you see there's someone else out there who you trust who's already tried it and recommends it. We do that all the time with restaurants and movies, right? So I thought it would be nice to do some reviews for you on products I've tried out and tested. When the time is right for making a purchasing decision, you'll be better informed and ready to hit the "Buy Now" button. Quality is important to me. There's nothing more frustrating than to be working on a project and realize the product is failing. So when The Art Chest invited me to review their set of paint brushes I was excited, yet admittedly a bit apprehensive. If I recommend a product, I want to make sure it's truly something I like and use in my studio on my own work. But this set did not disappoint! I've throughly tested them out and find them to be well-made, quality brushes. The new issue of Diva Mystic Magazine is out, and I'm so excited to announce that my art is on the cover! “Working Girl – Work The Sensitive’s Way” is the issue's title. This beautiful e-zine magazine has 130 pages overflowing with rich content and gorgeous images. It will guide and inspire you to a working-life fueled with passion and joy, making overwhelm and burnout a thing of the past! Click here to visit Diva Mystic Magazine to get your copy now! Okay, I confess. I'm the worst blogger in the world. Coming here to make a post today, I see it's been seven months since I've posted anything. Seven months! That's pretty embarassing to admit. Well, embarassing to admit to other bloggers, and those who read blogs. If I told my mom I hadn't blogged in seven months, she would probably be run-walking to her medicine cabinet, rummaging around to find a big 'ol bottle of goo for me to drink! I could try to make up some wild and crazy story about how I've written all of these amazing and funny posts throughout the year, and they all were inadvertently deleted by means which I have no control over. But, the truth is... I just plain forget. Yup, I forget I have a blog, and that people are coming here looking for new art postings, show information, techniques, tutorials, give aways, inspiration, funny stories, product reviews, or just plain old jibber-jabber! So when I DO remember, I never know what to post. Do I try to get you caught-up by giving a run-down of everything that's happened since my last posting? Or do I just jump in and give you the latest happening, even if it's been forever? Hhhmmm... decisions, decisions. January - Started taking online classes with "Lifebook 2013" and making lots of new art journal pages. February - Hubby Dale got excellent news from his oncologist and an all-clear report for his four year lung cancer anniversary! Yeah! March - Started videotaping & recording an online class. April - Taught my very first online class with "Lifebook 2013." So much fun!! May - Received a large wholesale order from a new vendor and the coolest, little shop in Broad Ripple, "Be ~ The Boutique." June - Taught my second class with "Lifebook 2013." Took Lilla Roger's "Make Art That Sells" 5-week online class. Amazing! Learn a lot and had so much fun creating new artwork each week! July - Art-on-the-Go with my daughter Monica working in our art journals. August - Worked on creating lots of new inventory for the holidays! Making plans with my daughter Monica to do a holiday boutique show the end of November. I must say, I so admire other artists who have the talent to keep all the balls in the air at the same time. It isn't easy to wear so many hats... artist, designer, blogger, marketer, promoter, art exhibitor, art fairs, giveaways, accountant, buyer, reviewer, instructor, photographer, videographer, editor... the list goes on and on. There's so many hats to wear, I can't even remember them all. But kudos to all the artists and crafters out there who manage to manage it all! You are an inspiration to the rest of us. I'm trying, and will keep trying, to stay on top of things. But if you can't find me here, please know you can always find updates about my art on my Joann Loftus Facebook Page. I hope you all had a very wonderful Christmas and Happy New Year! The holidays kept me quite busy this year with shopping, decorating, cooking, wrapping, hosting, etc. Every year I vow to simplify my life during the holidays, and yet every year it seems I continue to get wrapped up in it all. But I'm back in the swing of things now, and excited for the promise a new year holds! I love the idea that with each new year we get to start over, to begin again. And this year is no different. The prospects and possibilities of what "could be" makes me feel all squiggly inside. I love to imagine all the good things that can happen, the paintings I will create, the happiness I will feel. Some say this is living in a fantasy world, with your head in the clouds. Others, like me, believe great things come from positive thoughts. LifeBook 2013 is already in full swing. Already we've had several classes with awesome instructors and fun, new techniques. My first project, "Fairy Art Mother" cheers me on with positive words of encouragement! I hope you, too, will remember to believe in yourself and recognize how special you are! And when you start to feel life weighing you down, just keep going and "keep on keepin' on!" So excited to announce the WINNER for a spot in ”Life Book 2013.” Thanks to all who participated by posting to their blogs, Facebook and Twitter! Congratulations, Christine! I know you will absolutely LOVE learning new techniques and creating your Life Book! Your name will be added to the class participants and you will be receiving the class information via email. Although I have only one class spot to giveaway, I pulled out two more names for "surprise" giveaways! Congratulations Gina and Sigrun Linda! I will contact you both via Facebook to get your shipping addresses so I can send something special your way. I hope you enjoy your gifts! Again, thanks to all who participated. 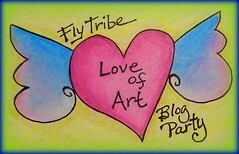 Please bookmark this blog and check back from time to time for more giveaways, tutorials and all sorts of arty-stuff!